Strike one up for the barbarian. So often, you just need the right story at the right time. I first read Cordwainer Smith last year and loved him. He’s excellent. However, the two I read for this round just didn’t do the trick. For some reason, Conan the Barbarian, did. The two by Robert E. Howard that I read for this round, “The God in the Bowl” (1952), and “Rogues in the House” (1934), follow the exact same formula though they were written nearly 20 years apart. A crime has been committed, a murder probably. Conan the Barbarian is on the scene, probably hired to protect someone or to commit a different crime, most likely a robbery. There is an investigation led by a powerful man, often a man with magical powers. Turns out the culprit is a supernatural being hiding in the room or the next room all along, sometimes behind a curtain. Conan kills it, then kills the bad people in the room, the ones worse than him at least, and maybe a few guards who were in the wrong place at the wrong time. Sometimes Conan takes a treasure and leaves town, sometimes he just leaves. It’s not art; it’s a good time. I enjoyed both stories more than I thought I would, once again. I’ve read six in this volume so far. While they have not always advanced to the next round, they have always entertained. 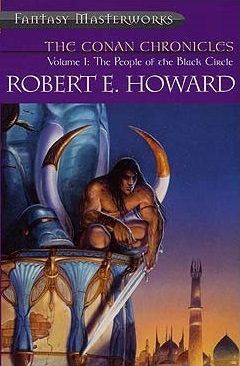 So, Robert E. Howard moves ahead in my tournament of short stories. I look forward to seeing just who, or what, Conan goes up against next. I am glad you liked these, James, but so far I have not really found either writer to my taste. Difference is good, though… . My goodness, I feel like these were real people you were hanging out with. Sounds like fun.